Have to go to a conference tomorrow, so won’t be making soup, and won’t have time to post any recipes. Thought I’d post today’s instead. Cuz the one we have is squishy and poorly made and falling apart, and this one was $200 off and we decided that if you only spend $300 on a couch you don’t mind if somebody’s (ahem) piano students climb all over it and stuff. I really wanted red or purple, but they only had it in “espresso,” so we bought 4 throw pillows, in various colours and embroideries, which cost $90 altogether. Not sure this ends up being a good deal, but you can’t just have a brown couch. 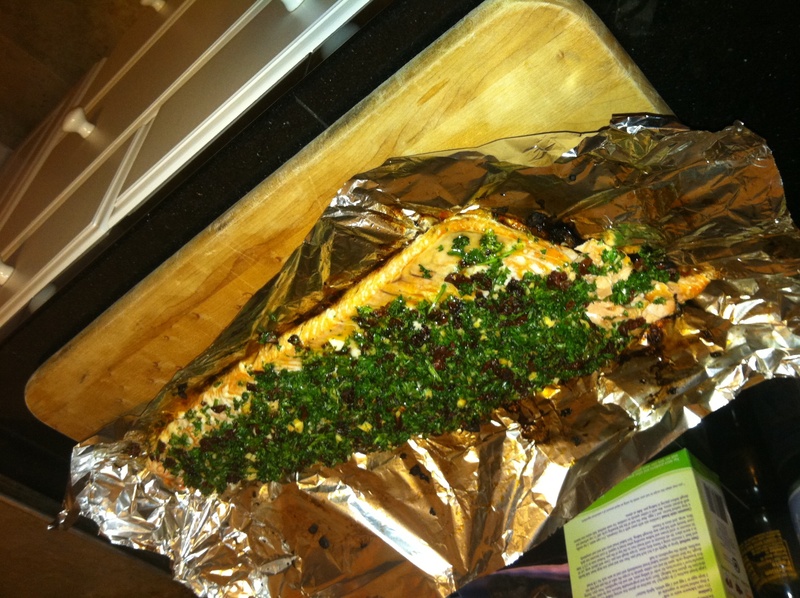 I have Husband’s permission to post our salmon recipe. This may actually be, basically, why I married him (see two paragraphs above; NOW the secret’s really out!!!) That and his mushroom risotto. And, well, never mind. Chop 1 bunch curly parsley really really fine. Sprinkle 10 cloves of garlic with a generous amount coarse salt and chop fine. 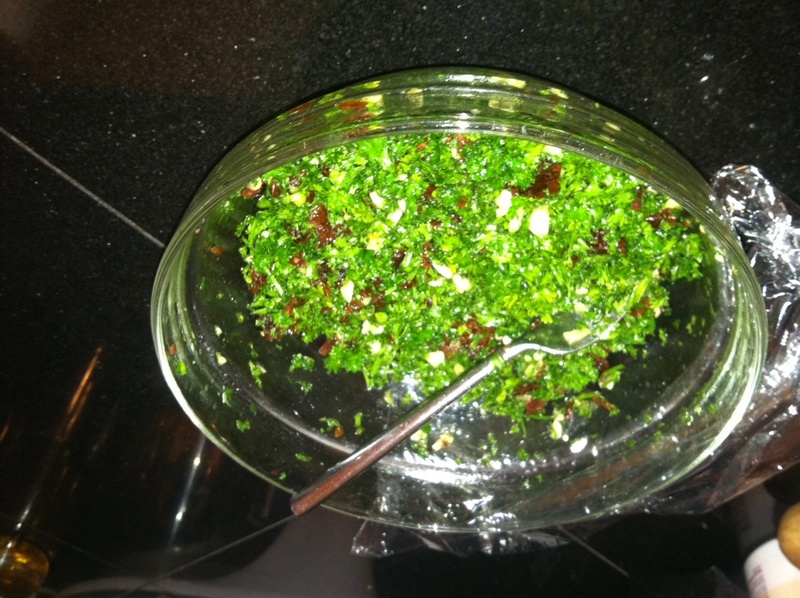 Mix these three things together and drizzle with olive oil until it kind of holds together. Stir and cover and let sit for AT LEAST 2 hours. 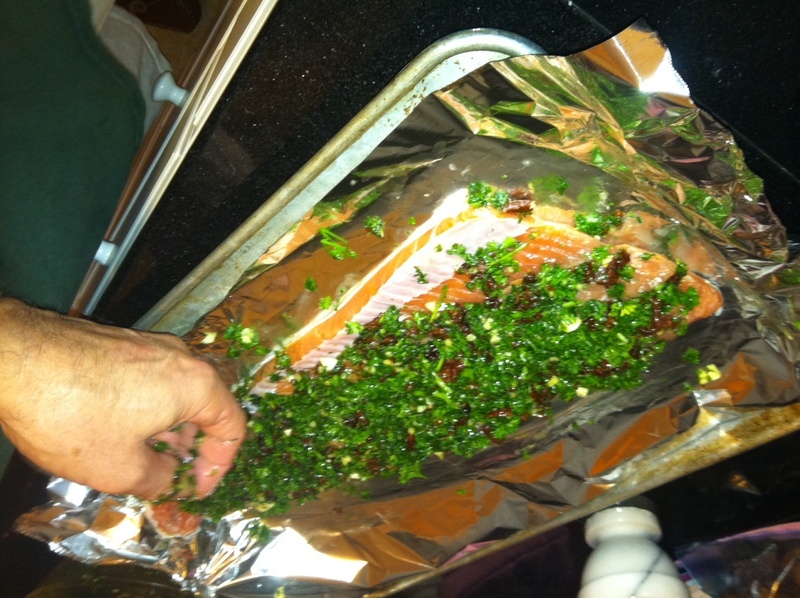 Cook on the foil over red-hot coals (close the lid of the grill) until salmon is thoroughly cooked — 15-20 minutes probably, depending on the thickness of the flesh. Serve with brown rice (we like organic short-grain) and a lightly-chilled chardonnay. Apologize to everyone you sit next to the next day because of the garlic aura with which you are surrounded. Mix 2 c. whole milk with 1/2 c. sugar and 1 1/2 T. of cornstarch. Whisk until foamy. Heat over medium heat, whisking occasionally, until bubbly and foamy (don’t boil it over). Remove from heat. Drain the juice off the pomegranate seeds into the milk mixture. We were pouring brandy off of raspberries after 6 weeks, so we squeezed 3 c. of raspberries through a cheesecloth to get the brandy and raspberry juice, and added that to the milk mixture. If you don’t happen to have some of that handy (ha! ), add 1/2 c. of raspberry, cranberry, or cherry juice. Process in an ice-cream maker until frozen. Put into a plastic bowl, cover, and then put in freezer ~ 1 hr. before serving. Thanks for sharing this recipe. I know that you know that I have shared this with yourselves; big brother and sister-in-law, and can attest to both the immediate gratification and the residual sustained glow. That looks really delicious. And I think garlic is a fragrance that we should all enjoy a lot more often! « do I even want to know. . .?